Though for many years I used to hike Mount Rubidoux in the mornings five or six times a week, there were quite a number of months that I didn’t do that. There were a couple reasons for my absence, one better than the other. I have a bit of sciatica, a pinching of the sciatic nerve which produces pain in my legs, primarily the left one. And I was quite disgusted that after the the trail was resurfaced, there was a great deal of local publicity about it which resulted in large numbers of people hiking the mountain. Sometimes it seemed that the crowds at 5:00 am were nearly as bad as the queue lines at Disneyland. The trail is a one lane road that twists and spirals around the mountain. 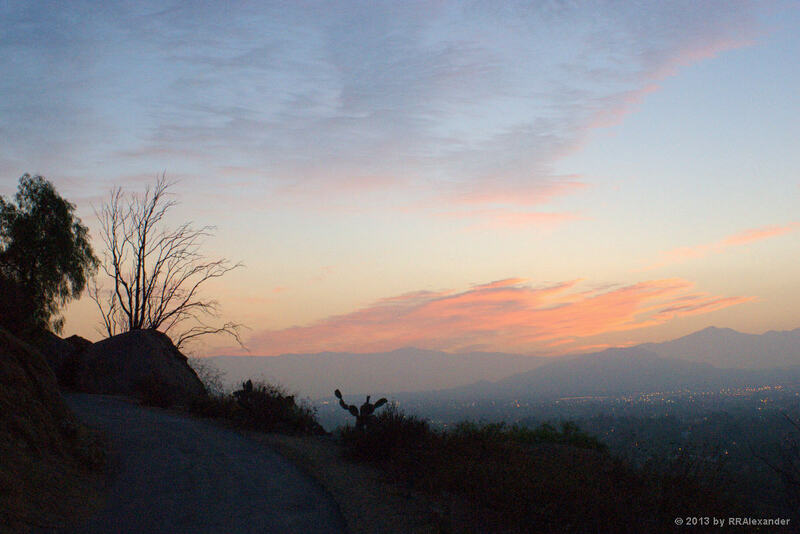 In the 1970s and 1980s the trail was open to motor vehicles and I used to drive up the mountain and watch the wall of smog roll in from San Bernardino to the north in the early morning after my graveyard shift at the local newspaper or during daylight, just for the view. The views from the mountain have always been excellent. The smog isn’t nearly as bad nowadays, so there is no longer a “wall”. During the heat of summer, the sciatica has eased up a great deal. It seemed a good thing to try to get back in the habit of “walking the mountain”, so a couple weeks ago I began easing back into it by hiking in Sycamore Canyon on the east rim of the valley that the City of Riverside lies within, the “Valley of Smoke” as it was called in the dimming past. A few days ago I went to the mountain. That first day was a struggle, but I wanted to push through the low-grade pain. The trail seemed a great deal steeper than I remembered and by the time I reached the crest and started back down, my t-shirt was fairly well soaked with sweat. I took a couple days off to let the lactic acid dissipate from the muscles that had been little used for so long. Back on the trail a couple days ago, it suddenly felt like I got my legs and rhythm back a quarter of the way up the trail. I have the idea that if I get back into the practice of hiking the mountain five or six days a week again, I may be able to keep going and push through the increasing pain as the colder seasons set in. The photo above was taken this morning on the lower spiral of the trail at the northeast shoulder of the mountain with my Nikon D200 and a Nikon 28mm prime lens. I’m pretty sure thats a Mutant Ninja Turtle off-center to the left.